Slowly, but surely, the Oculus Rift is transporting your entire body, not just your face, into virtual reality and Oculus Touch takes things to the next level. The Facebook-owned company unveiled its Oculus Touch Half Moon controller prototype today, finally giving us a VR-worthy input device and alternative to the now-included controller from Xbox One. More than just a controller, Oculus Touch tracks your hands through the Oculus Rift camera. They wrap around your hands, but remain lightweight, ergonomic and comfortable for long periods of play, according to Oculus VR founder Palmer Luckey. 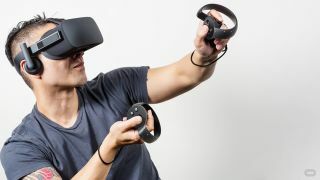 The design, when combined with the Oculus Rift, is supposed to let you use your hands in a game just like you would use them in the real world. Luckey called instinctive gameplay "low mental load". Oculus Touch has an ergonomic design, but manages to fit an analog stick, two buttons and an analog trigger. There's a controller for for each hand, because, as Luckey pointed out to us today, "You have two hands." We checked. He's right. An additional analog hand trigger – located beneath your middle fingers – is especially important for gaming. This would allow you to pick up a virtual gun and let you use your index finger to fire, for instance. The new Touch controllers are supposed immerse you into games, care of being cable-free and containing natural-feeling haptic feedback. Powering these capabilities are integrated high-precision, low-latency six-degree-of-freedom tracking – the same level of positional tracking provided in the Rift. That's in addition to "integrated inertial measurement units," Luckey said on stage. With development support, it'll be able detect a set of finger gestures and natural hands poses, like pointing, waving or giving a thumbs up. This could take Facebook liking to a whole new level, but hopefully it doesn't stop there. This type of input is enabled by an array of sensors mounted throughout the insides of the device. Luckey and the Oculus team built a demo called Toybox used to design and test out the Half Moon controllers' capabilities. The demo allows players to manipulate weapons, rip limbs off of robots, set off explosives and even punch garden gnomes. This sandbox-like demo is actually a multiplayer experience designed to make multiple players feel as if they're in the same virtual space, gesturing and interacting with one another using these Half Moon controllers. Luckily, Toybox will be playable during the upcoming E3 2015. Expect Oculus Touch in the first half of next year, following the early 2016 Oculus Rift release date.